We manufacture safe Calibration Gas which is commonly used at workplaces as well as for industrial purposes. It is available in an unadulterated form and is available in two variants: calibration gas mixtures and safety calibration gas. We provide timely delivery of our products and constantly work to maintain the consistency in quality. 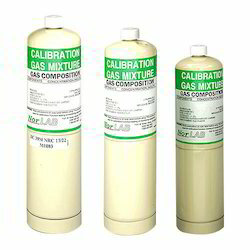 We offer extensive range of Calibration Gas Mixtures which is a mixture of various industrial gases. It has a accurate gravimetric and volumetric techniques according to both national and international industrial quality standards. It is available in an unadulterated form and is widely used in various industries such as automobiles, chemicals, fabrication, pharmaceuticals and food & beverages industry. It is stored in a pipe line pursuing through liquid nitrogen. We are highly recommended for manufacturing Safety Calibration Gases which are used as a safety solution within workplace. The composition of the gases used while manufacturing it accurate and comprises of a well mixture of solutions. It is effective in its product line which is defined according to the industrial norms. It is highly demanded by our customers for its consistent quality and economical price.